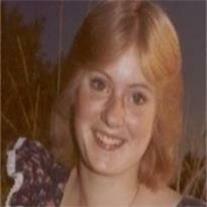 Lori Kay Keenan died Wednesday June 23rd 2010 in Mesa Arizona. Lori was born April 8th 1962 in Walla Walla Washington. Her proud parents Bill and Nona Simmons took her home to Milton Free water Oregon where she grew up. As a child and an adult Lori loved fishing, camping, boating and spending time with her friends. She attended Tum-A-Lum elementary and graduated from Mc. Laughlin High School in 1980. She was married in her home town to James Holmes in the springtime of 1981. They were married until the spring of 1997 when Jimbo passed. David loved Lori the moment he met her in the winter of 1999 as he left his hat with her to symbolize his return home to marry her. They married at the historic Hitching Post in Coeur de lane Idaho in January 1st 2001. Together they enjoyed many activities together like traveling to as many lighthouses up and down the Washington and Oregon coastline as they could. Traveling together to see family and friends as well as making new ones was part of who Lori and David were together. Lori worked for S.M.I.L.E. LLC. And was the ray of sunshine for her coworkers. She was preceded in death by her grandparents on both sides and her parents William L. Simmons and Nona J. Pettry Simmons, Her first husband James J. Holmes and a handful of Aunts and Uncles on her mother’s side. She is survived by her husband David P. Keenan, her mother in law Ida Wheeler, her father in law Dave H. Wheeler, her sister Billie J. Simmons, her sister in law Lisa Gallegos, spouse and their three children. Andrea Bradley, spouse, and three children. Cindy Sanchez, spouse and three children. Tami Checon, spouse, and three children. Other family members include Crystal Downing, Serina Toomey, Johnathan Toomey, William Toomey, Bernice Toomey as well as many other Aunts, Uncles, Cousins and many loving friends. The service honoring Lori begins at 10am on Tuesday June 29th 2010. There will be a viewing available beginning at 12pm and ending at 2pm the same day. There will be an additional service held in her memory in her hometown of Milton Free Water however a date and time has not been set yet.